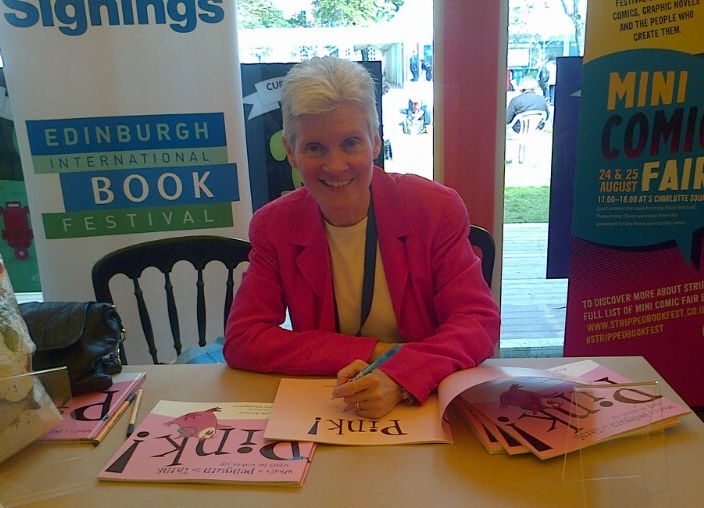 I had a great time at the Edinburgh Book Festival this summer, reading Pink! to a big audience of pre-schoolers and their families with the help of three very talented singers. 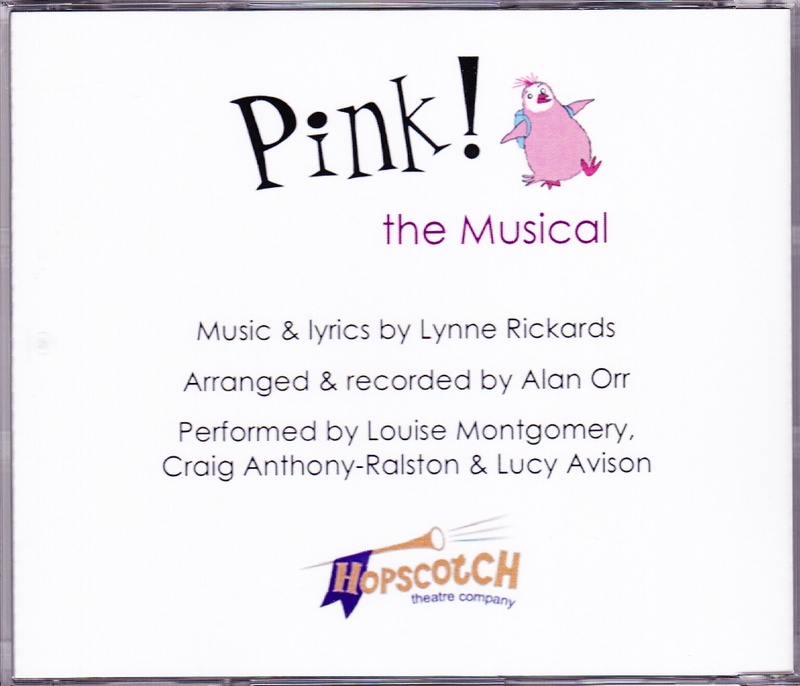 While I read the story, Sophie Williams, Hugh McKay and Anna Cooper entertained the audience with all the songs from Pink! the Musical. My three brilliant penguins all study at St Mary’s Music School in Edinburgh. Not only are they excellent singers, they also play instruments (Sophie plays violin and Hugh and Anna play cello). 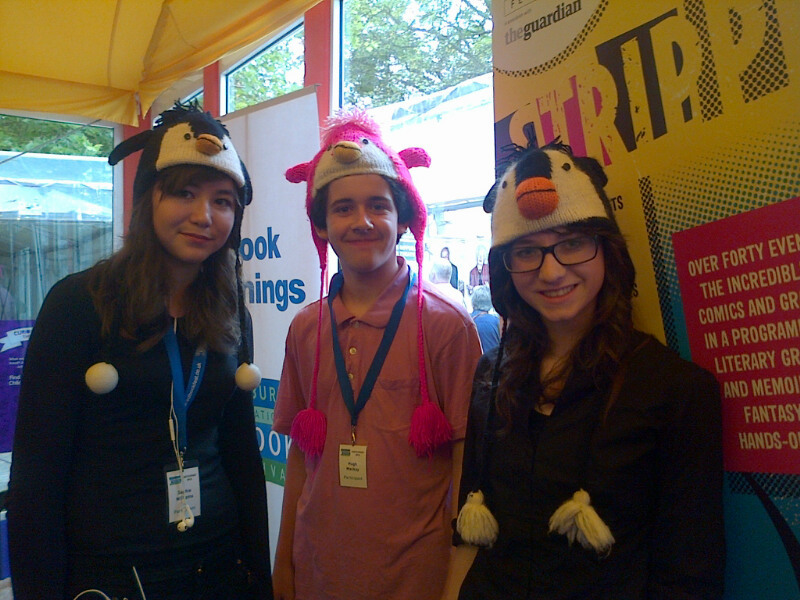 As you can see, they wore penguin hats for our show, and Hugh was dressed in pink as the central character in the story. They all did a fantastic job, so I want to say a big THANK YOU to Sophie, Hugh and Anna! We had lots of fun singing all the Pink! songs, and at the end everyone in the audience joined in with the Fun to be a Penguin song! If you want to download the song and the lyrics for yourself, just visit the Hopscotch Theatre website HERE and look at the bottom right where it says Songs. Pink! 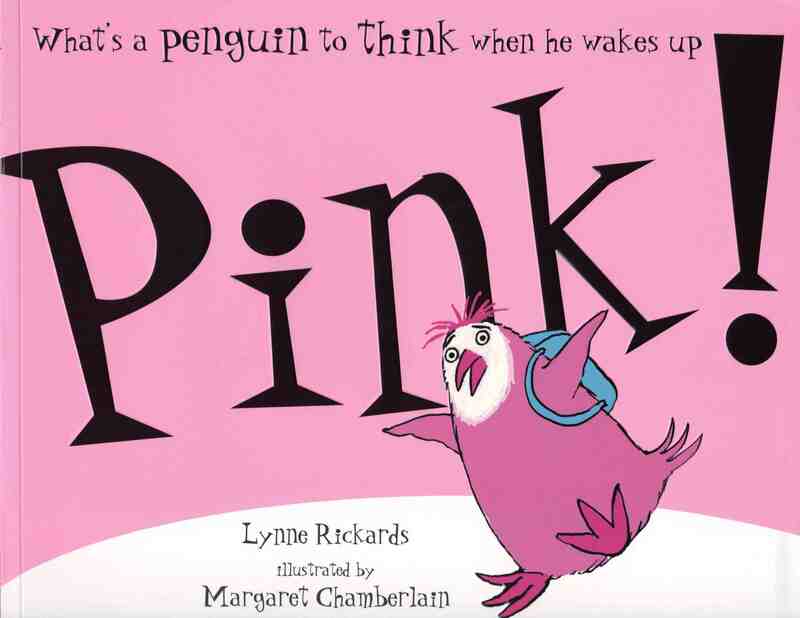 is the story of a little penguin called Patrick who is very upset when he wakes up one morning to find he has turned pink overnight. His friends all tease him and the doctor can’t fix him so he goes on a journey to see if he’s better off living with pink flamingos in Africa. As it turns out, penguins and flamingos couldn’t be more different, so he swims home again to a big welcome from all his friends and family. In the end, Patrick decides that being pink is okay after all. Recently Pink! has been republished by a small Edinburgh publisher called Birlinn Limited. They are a great group of people who have been really supportive of all my efforts to turn the book into a musical. If you visit their website you will see a whole page dedicated to Pink! which includes video clips of the Hopscotch Theatre production that toured around Scottish schools last spring. After our show, Sophie, Anna, Hugh and I made our way to the signing tent, where I sat and signed books and the singers posed for photos with members of the audience. It was lovely to meet lots of children and ask them if they enjoyed singing the penguin song. They were pleased to discover that you can buy both the book and the CD in the Children’s Bookshop at the festival! It was great to think that lots of children would be singing along with Patrick in the car on the way home! One of my favourite islands on the west coast of Scotland is the Isle of Mull. It has everything you could ask for – white sand beaches, dramatic cliffs, ancient castles, beautiful wildlife and even a whisky distillery. The photo above shows Calgary Bay, a fantastic stretch of sand facing west which always looks amazing in the late afternoon sunshine. 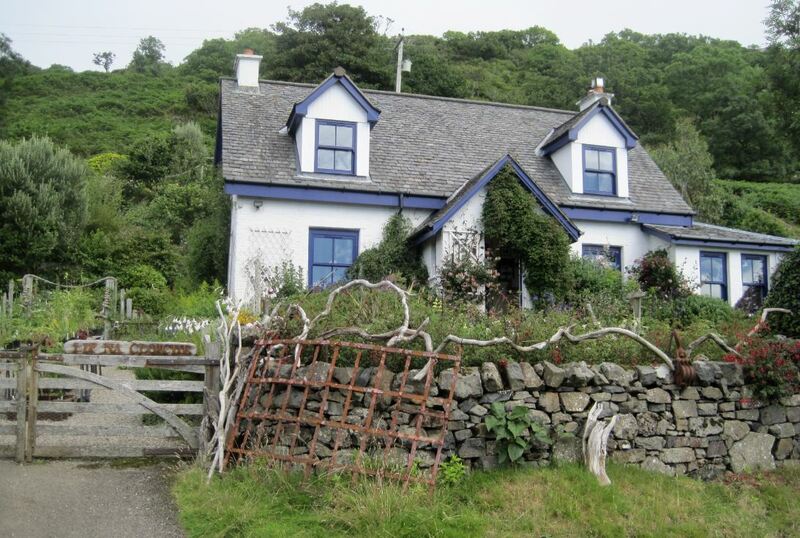 Recently we spent a week on Mull and stayed in a self-catering cottage up the hill from Tobermory harbour. It was a great place to explore with all its brightly coloured houses and quirky shopfronts. 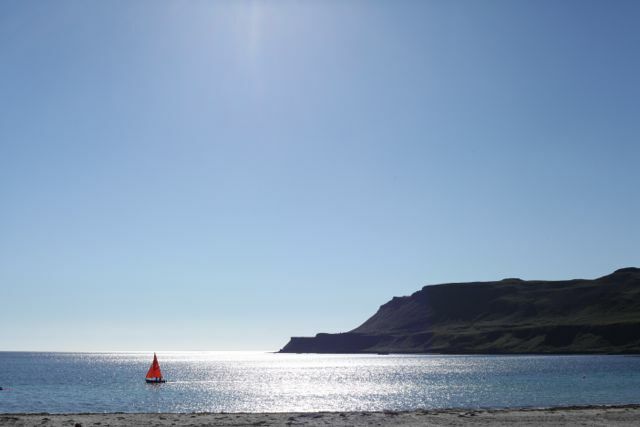 The local handicrafts reflect strong wildlife and nautical themes, and you can find puffins, eagles and all sorts of sea creatures on tea towels, greeting cards, paintings and ceramics. 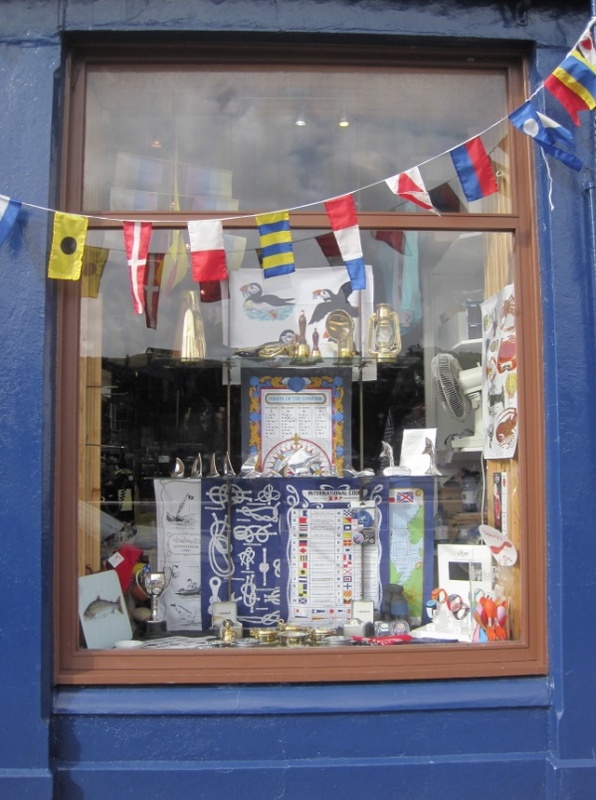 This blue shop was displaying a puffin tea towel, sailboats made of shells and an elaborate chart of sailors’ knots. Another shop was painted bright pink and had lots of tempting holiday treats on display. 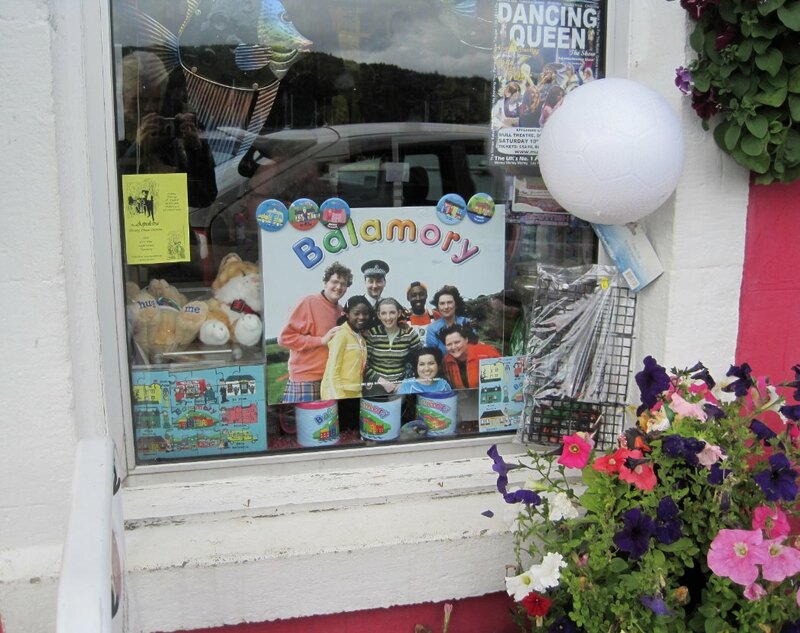 In the window of the Tobermory Corner Shop was a poster showing the cast of the BBC children’s programme Balamory which was filmed here. I remember watching that show with my kids when they were small. My favourite character was PC Plum because he had a great singing voice! As I wandered around the other shops I came across one called the Hebridean Whale and Dolphin Trust. 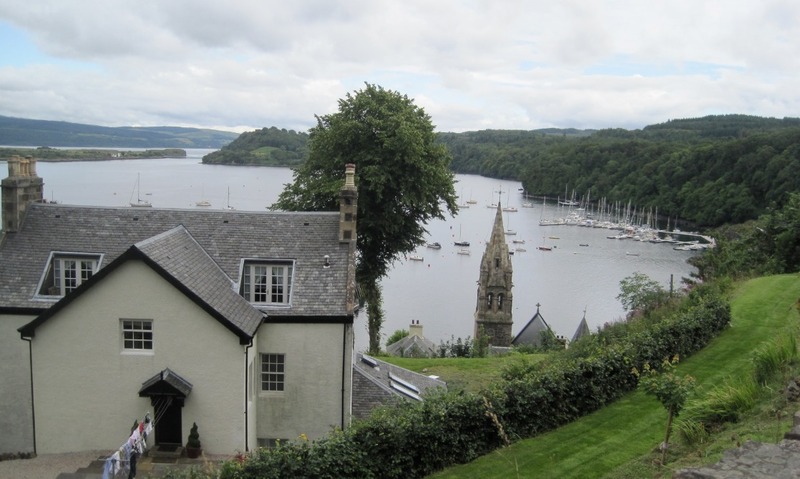 This was a lovely place full of crafts and toys, and its purpose was to raise awareness (and funds) to support research, education and conservation of Scottish whales, dolphins and porpoises. 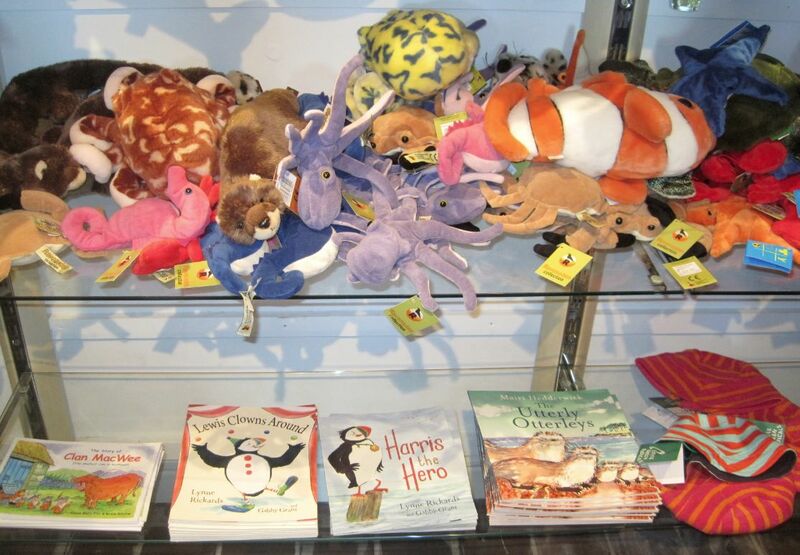 Perhaps they are interested in promoting puffins as well, because I came across a small selection of books at the back of the shop which included my two Picture Kelpies, Lewis Clowns Around and Harris the Hero! What a nice surprise! 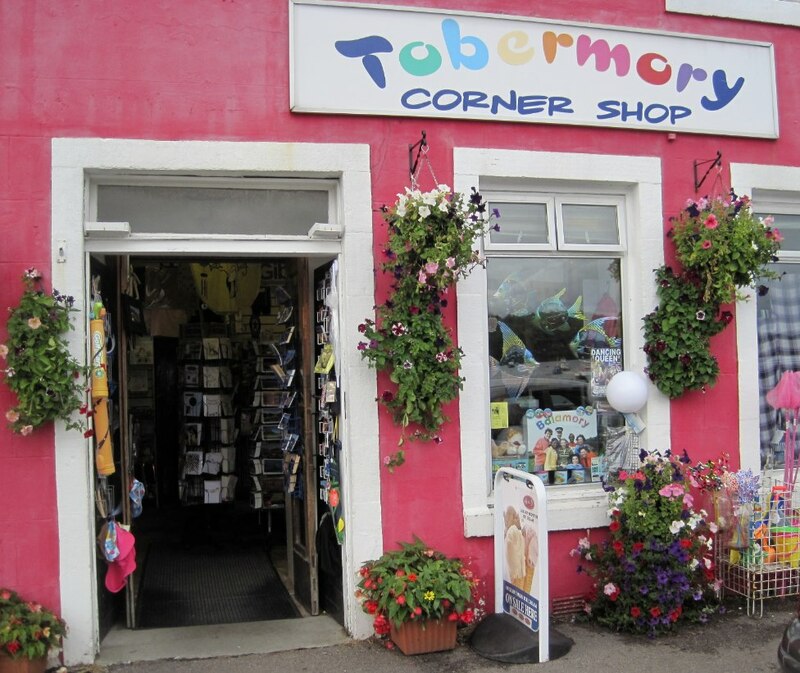 The town of Tobermory is perched on a steep hill overlooking the harbour. We climbed up one afternoon to look down across the whole area, and explored the grounds of Tobermory High School and a local park up on the hill. 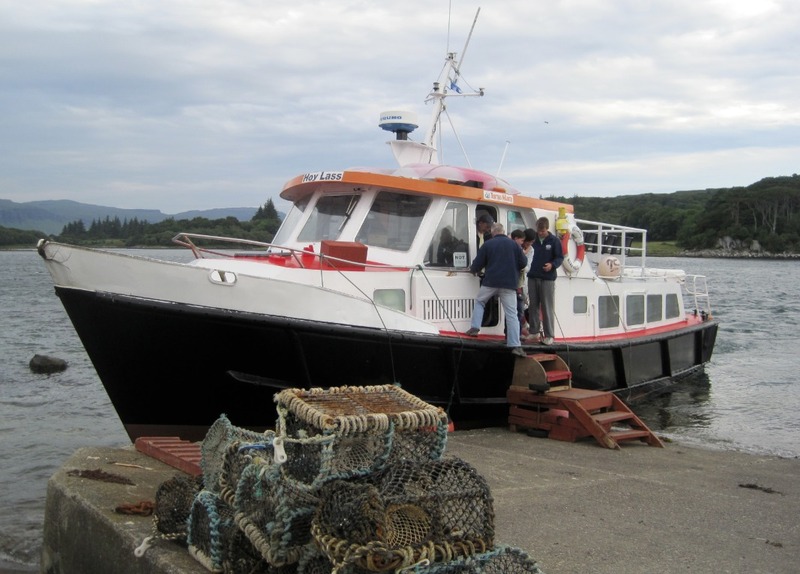 From Mull there are excursions to other nearby islands. 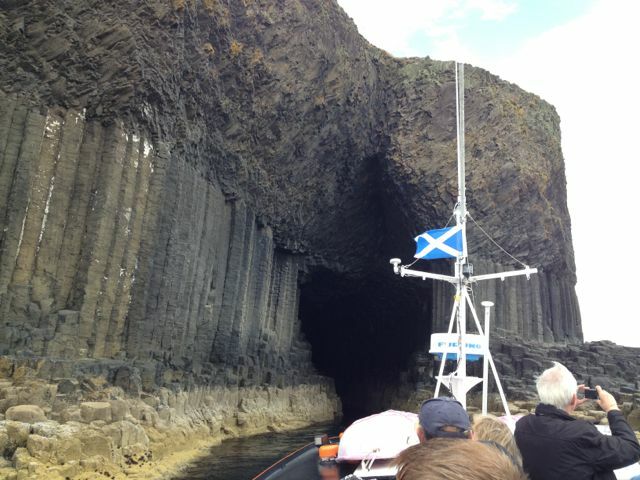 We decided to take a boat trip to Staffa and Iona, which are two very different islands. Staffa (which means “Pillar Island” in Norse) is a strange and wonderful volcanic formation that rises from the sea like a whale’s mouth. 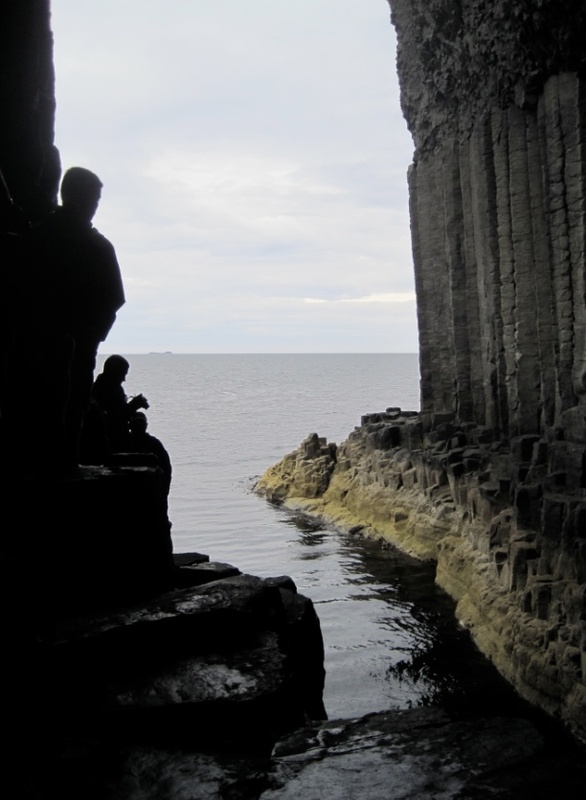 Most famous for its dramatic caves, Staffa gets lots of visitors every summer. Fingal’s Cave (shown above) is the subject of an overture composed by Felix Mendelssohn in 1829 that you can listen to HERE. 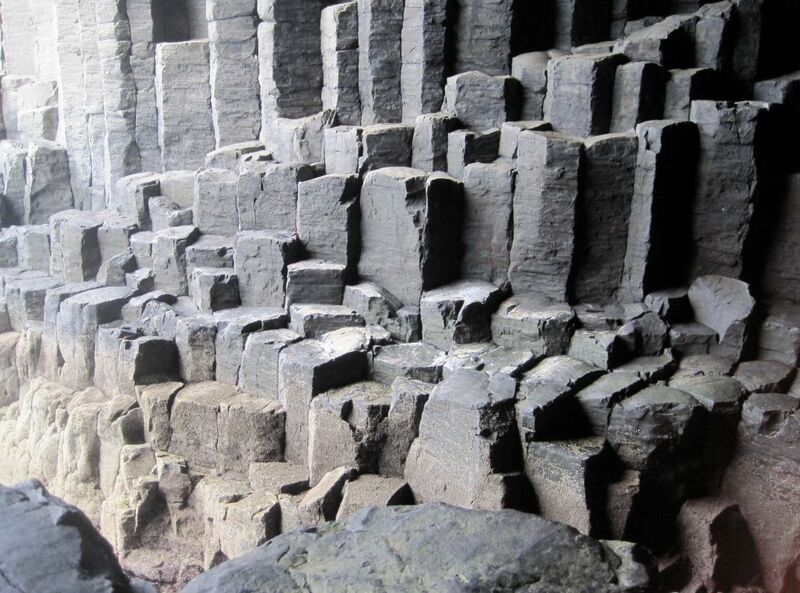 After his music was played in public, Staffa became very popular as a tourist destination. Even Queen Victoria wanted to see it! 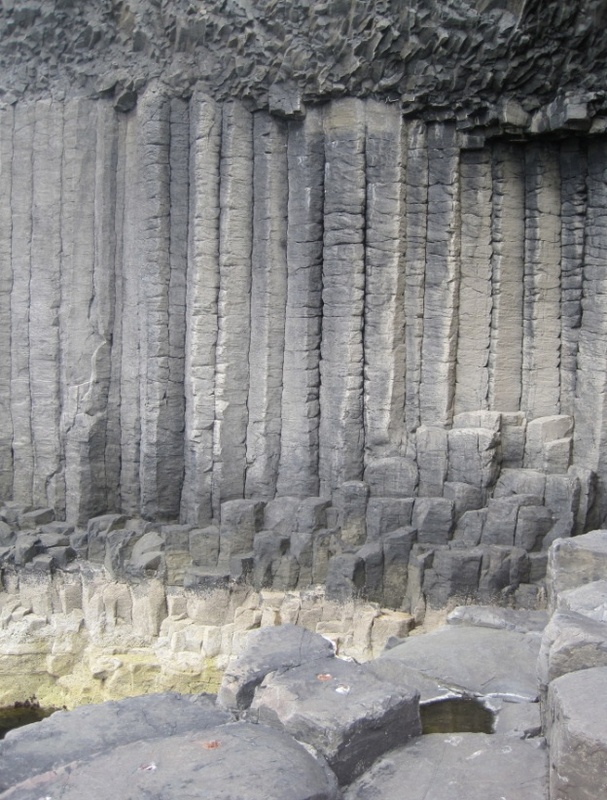 The unusual column formation of the basalt rock was produced 60 million years ago when continental plates on the earth’s crust shifted and pulled apart, and volcanic lava rose up from the ocean floor. As the molten rock cooled it shrank and fractured into geometric columns as it hardened. You can actually climb some way into the cave, and the picture above shows the rock at the cave mouth. As I walked further in I could see water crashing down below, with glowing blue jellyfish floating near the surface. Once in a while the waves would make a low, thundering noise as they hit the far end of the cave and echoed around the walls. The further in you go, the darker and scarier it gets! The hardest part was getting back out, as there were lots of people holding onto the handrail for dear life! The second island we visited was Iona, which couldn’t be more different. 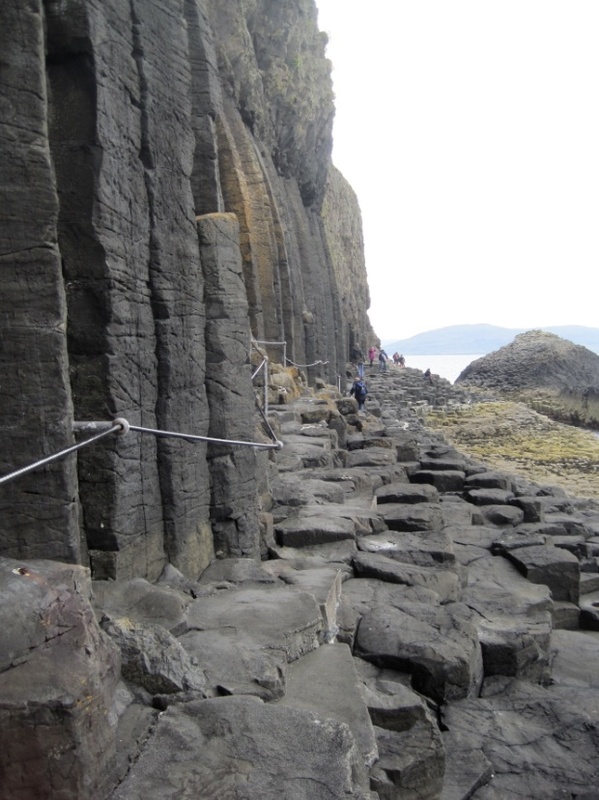 While Staffa is only inhabited by seabirds on its grassy top and steep cliffs, Iona has been a settled community since 563 AD when Columba, an Irish missionary priest, came to the island and established the first Christian community there. 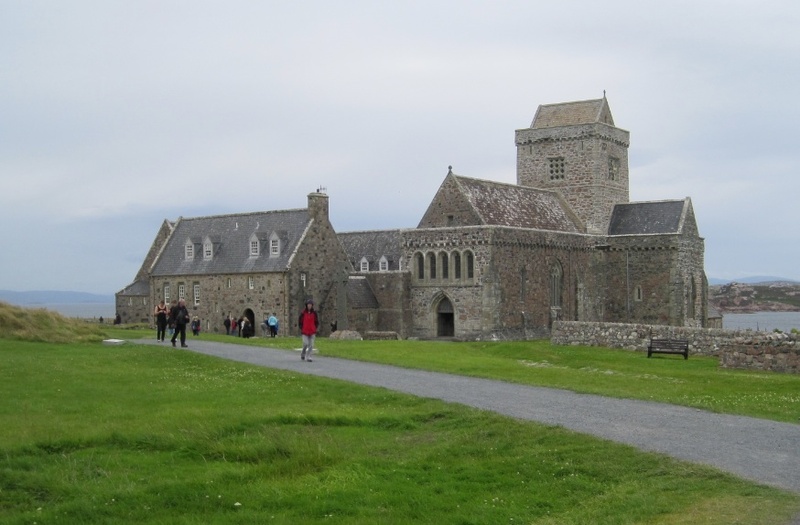 The many visitors to Iona today are drawn by its peaceful atmosphere and the spiritual legacy embodied by Iona Abbey. This is the site where St Columba founded his monastery in 563 AD, and from that time Iona became a focal point for Christian practice and missionary work. The buildings you see above were built over a period of several hundred years. The original abbey was developed between the 12th and 15th centuries, and then substantially rebuilt in the 19th and 20th centuries. We had two hours to explore the island and learn about all the ancient Scottish kings buried at the abbey (including Macbeth, they say!) 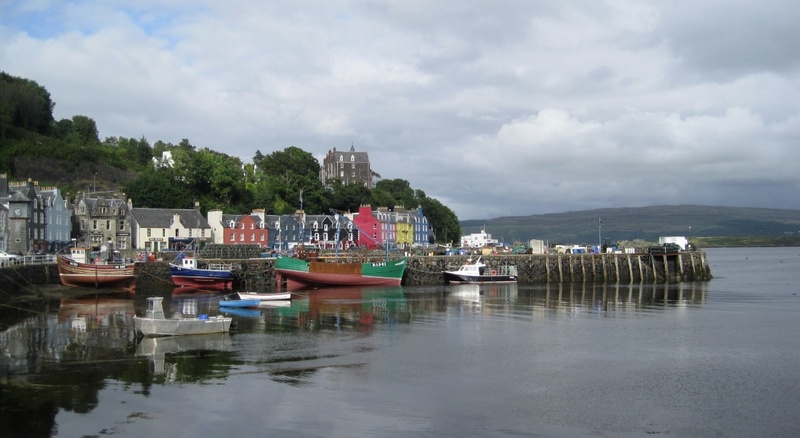 Then it was time to get back on our boat and chug back to Tobermory. On our last day as we headed for the ferry home, we stopped at a charming garden called Lip Na Cloiche (Gaelic for “Edge of the Rock”). 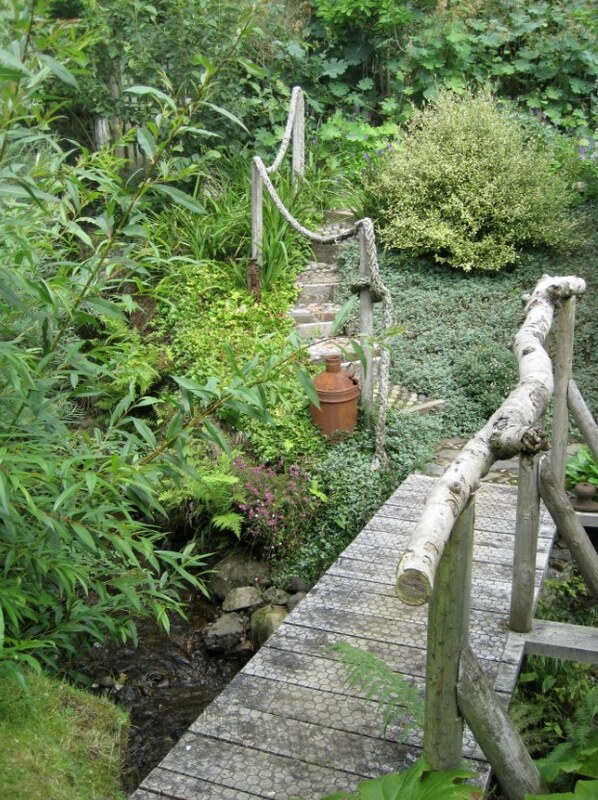 The little cottage stands near the road, and the garden climbs up the hill behind in an amazing jumble of exotic and beautiful plants, decorative pathways, wooden bridges and weather-beaten driftwood and iron implements. 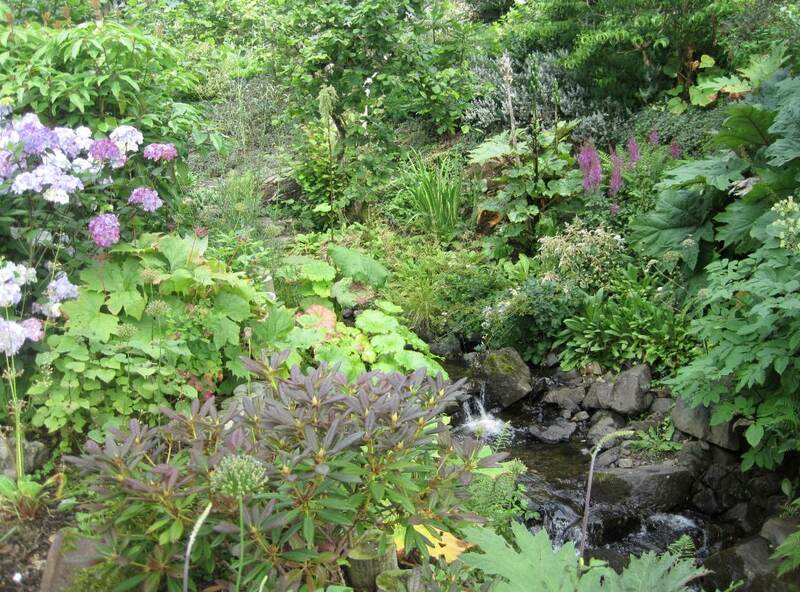 One woman, Lucy Mackenzie, has created this unique garden over a number of years and she allows the public to wander around it at no charge. You can buy potted plants, crafts and cards, and even stay in the house for bed and breakfast if you like! If we hadn’t been booked on our ferry home, we might have been tempted! It will have to wait until our next visit.